How Many Calories are in a Pink Lady Apple? The Pink Lady apple, also known as the Cripps Pink apple, is harvested in late October and can be found for sale from November through August each year. The pink color characteristic of Pink Lady apples is attributed to the temperatures they experience while growing in the fall. 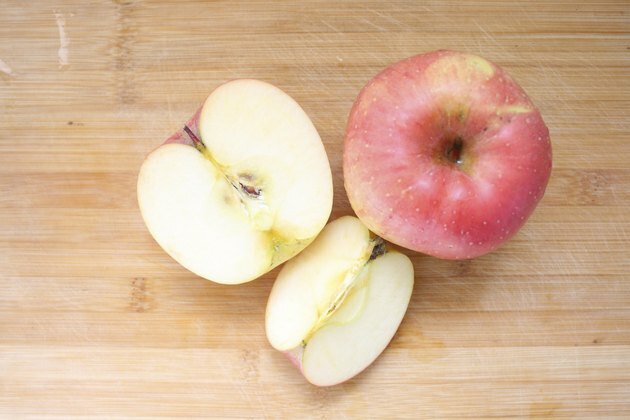 Pink Lady apples were created through a breeding program in Western Australia that crossed the Golden Delicious and Lady Williams apple varieties. They were introduced to the market in 1985. In an average Pink Lady apple, there are 71 calories. Carbohydrates provide 62.8 of those 71 calories, or 88 percent. Two of the calories in an average Pink Lady are from protein. Fat contributes only 0.9 calories to the snack, making up 1 percent of the total calorie distribution.